Kiwi FC have won the 2016 OFC Champions League Preliminary and secured qualification through to the group stages of the 2016 OFC Champions League in New Zealand. The Samoa club champions headed into Match Day 3 requiring only a draw to guarantee them the title, but celebrated in style with a 7-1 drubbing of Veitongo FC. It means they secure the last remaining spot at the 2016 OFC Champions League, where they will join Nadi FC from Fiji, AS Magenta of New Caledonia and Tahiti’s AS Tefana in Group C.
Kiwi FC coach Martin Tamasese says it was pleasing to see his side get through the match after a slow start which saw them go down 1-0 after 23 minutes. “I feel really happy today and I thank the boys for the way they played,” Tamasese says. “We really struggled in the first half but came back in the second and were able to score some goals. “I put that down to the boys feeling a bit too relaxed, but during half time I told them it has been a waste of time winning our first two games if we lose this one. Veitongo FC came out firing to start the game, dominating as they took advantage of a Kiwi side who struggled to find their way early in the match. A free kick from 25 yards on 23 minutes presented the chance to go ahead, and after Kilifi Uele floated the ball into the box Hemaloto Polovili got a touch to direct the ball past keeper James McPeake for a 1-0 lead. But delight quickly turned to despair for the Tonga club champions when they conceded a goal two minutes later thanks to Jamie Mason follow-up, before midfielder Kamaliele Papani was sent from the field after receiving a second yellow card. In the 31st minute Sam Blackburn netted to take a 2-1 lead for Kiwi as Veintongo started to show the signs of playing a man down. Youngster Anthony Likiliki had a couple of good chances to bring Veitongo back even before half time, but was just off target on both occasions. It took only two minutes of the second half for Kiwi to add to their lead, with defender James Sutcliffe blasting home a free kick from just outside the box. Both Blackburn and Mason added further goals before the 70th minute, as Veitongo failed to keep up with the pace of the game. Goals in minutes 90 and 93 – scored by Blackburn and Mason respectively – blew the score out to seven and capped off a stellar OFC Champions League Preliminary campaign for Kiwi FC. Veitongo on the other hand lamented not being able to carry on from their positive start, with the defeat leaving them as the only team in the competition without a victory. “We made a really good start and were in control for some of the start of the game, but in the end we just couldn’t keep it up,” coach Tuia Falepapalangi says. “It really hurt us when we lost one of our experienced players early on to two yellow cards, from there it was tough for us to hold on and come back. “It is disappointing to go out the way we did, but I know the players will have taken something from this. In the earlier game on Match Day 3 host side Tupapa Maraerenga FC rallied to beat Utulei Youth FC 9-1. At the time it meant they temporarily regained the competition lead with Kiwi still to play, but in the end wasn’t enough for them to overcome the points lost in their defeat by Kiwi on Match Day 2. Tupapa coach Delaney Yaqona says his side showed signs of fatigue after playing such a physically and mentally taxing game against Kiwi two days earlier, while they also made life hard for themselves by getting two players sent off for collecting two yellow cards. “In the first half you could see the effects of Thursday’s game were still there in the minds of the boys, they found it very hard to settle and things weren’t happening,” Yaqona says. “The cooling break after 30 minutes came at a good time and I was able to have a quick word to the boys and tell them not to get so frustrated. But all credit to the boys, they got the goals and got the win. “As a coach I don’t tolerate ill-discipline on the field, but the emotion got too much for the boys. It was very unfortunate that we had those red cards, it wasn’t a good look. Tupapa got the scoring started on 15 minutes when New Zealand-based striker Jared Colligan leaped high to header in a Rhys Ruka cross. Tupapa dominated the next 10 minutes, creating a number of chances only to be denied by last-ditch efforts from the Utulei Youth defence. But they couldn’t deny Tupapa a second on the half hour when Ruka shot from the back post to double the lead for the Cook Islands club champions. A Campbell Best header a minute before the end of regulation time in the half took the lead out to 3-0. The second period started with Tupapa again peppering the Utulei goal, and had it not been for a couple of brilliant defensive efforts from central defender Neemia Kaleopa the American Samoa side would have found themselves down by even more. The break in scoring ended in emphatic fashion in the 57th minute, with three goals netted in the five minutes which followed. First Best secured his hat-trick with two goals in as many minutes, before Utulei grabbed one of their own after Kaleopa Siligi fired direct from a free kick just outside the 18 yard box. The introduction of substitute forward Josh Karika delivered rewards for Tupapa almost immediately, with the big striker using his combination of pace and strength to cause trouble for the Utulei backline. By the end of the match he had a hat-trick, scoring goals in the 74th, 88th and the fifth minute of added time. 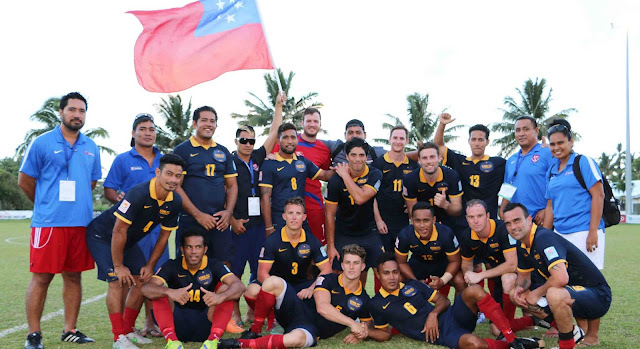 Cook Islands national team player Grover Harmon added his name to the scoresheet on 90 minutes to make nine for Tupapa. The only blight on the match for the host side was Anthony Samuela and Best both being shown their second yellow cards of the match and leaving their team to play with nine. Utulei Youth coach Ututoa Ino conceded his team were beaten by a much better side on the day. “We have no excuses, Tupapa were ready for us and we thought we were ready for them, but looking back we should have been better prepared,” Ino says. “It was a good experience for my team and for me too. The 2016 OFC Champions League will be held in Auckland in April this year.